” .. stretches its hundred hands upon mountain and meadow, Seizing the rocks and the rivers, and piling huge shadows together. 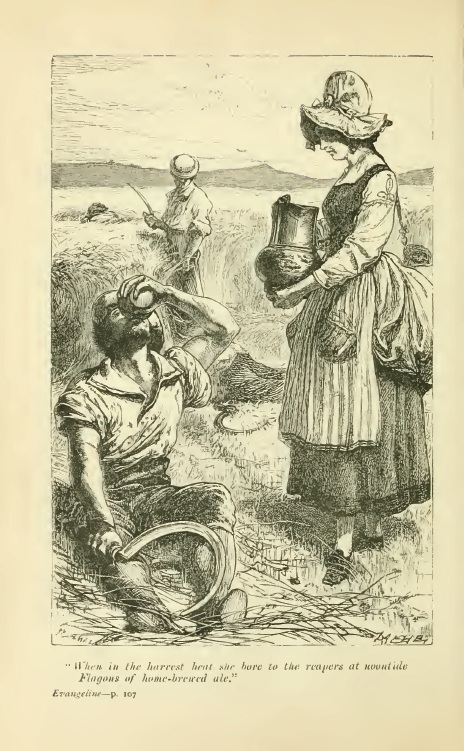 ” Illustration, Myles Birket Foster; wood engraving for an edition of Évangéline. 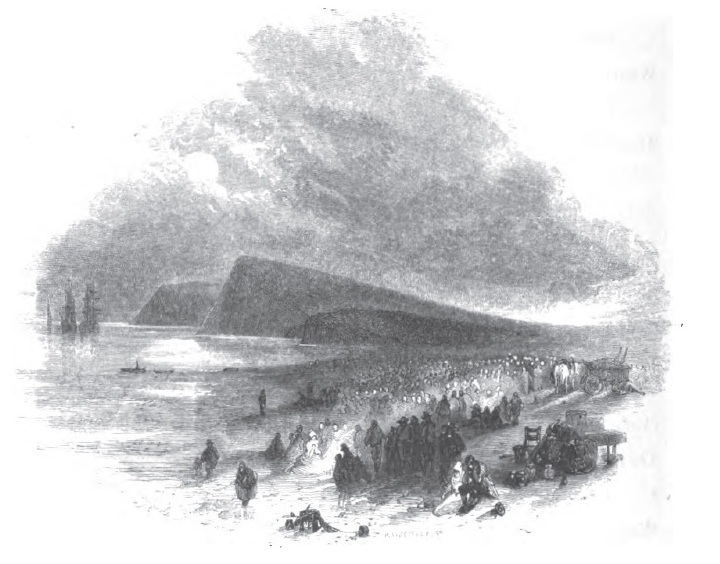 Opened, and welcomed the sea to wander at will o’er the meadows. Looked on the happy valley, but ne’er from their station descended. 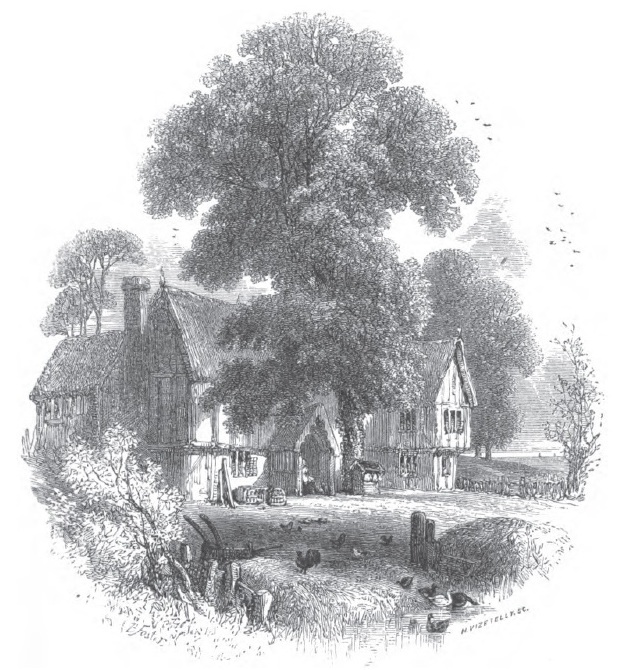 “Firmly builded with rafters of Oak, the house of the Farmer .. ” Illustration: engraving by Myles Birket Foster executed for Évangéline. Gentle Évangéline lived, his child, and the pride of the village. Black, yet how softly they gleamed beneath the brown shade of her tresses ! Flagons of home-brewed ale, ah ! fair in sooth was the maiden. Homeward serenely she walked with God’s benediction upon her. 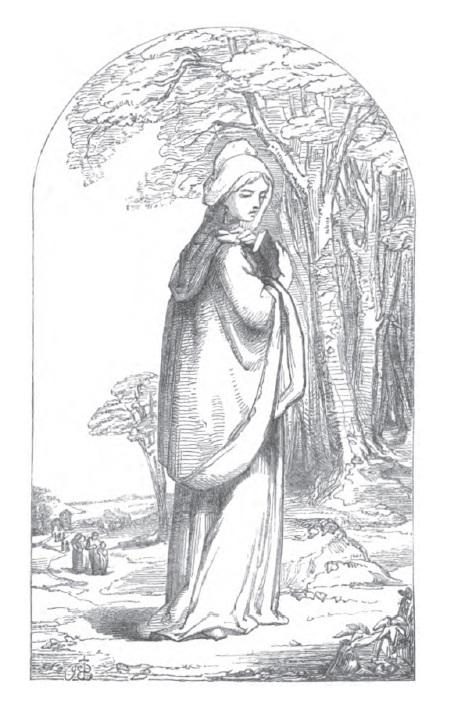 Illustration from Jane E. Benham, wood engraving. Built o’er a box for the poor, or the blessed image of Mary. Lived on his sunny farm, and Évangéline governed his household. Happy was he who might touch her hand or the hem of her garment ! Down the hillside bounding, they glided away o’er the meadow. Lucky was he who found that stone in the nest of the swallow ! Gladdened the earth with its light, and ripened thought into action. And the retreating sun the sign of the Scorpion enters. Desolate northern bays to the shores of tropical islands. Wrestled the trees of the forests, as Jacob of old with the angel. All the signs foretold a winter long and inclement. Cold would the winter be, for thick was the fur of the foxes. Called by the pious Acadian peasants the Summer of All-Saints ! Now recommenced the reign of rest and affection and stillness. Brought back the evening star to the sky, and the herds to the homestead. And with their nostrils distended inhaling the freshness of evening. Quietly paced and slow, as if conscious of human affection. When from the forest at night, through the starry silence, the wolves howled. Laden with briny hay, that filled the air with its odor. Nodded in bright array, like hollyhocks heavy with blossoms. Into the sounding pails the foaming streamlets descended. Rattled the wooden bars, and all for a season was silent. Darted his own huge shadow, and vanished away into darkness. Caught and reflected the flame, as shields of armies the sunshine. Sang in their Norman orchards and bright Burgundian vineyards. Spinning flax for the loom, that stood in the corner behind her. Followed the old man’s song, and united the fragments together. So, in each pause of the song, with measured motion the clock clicked. Sounded the wooden latch, and the door swung back on its hinges. And by her beating heart Évangéline knew who was with him. “Benedict Bellefontaine, thou hast ever thy jest and thy ballad ! Gloomy forebodings of ill, and see only ruin before them. Ride in the Gaspereau’s mouth, with their cannon pointed against us. “Louisburg is not forgotten, nor Beau Séjour, nor Port Royal. Waiting with anxious hearts the dubious fate of to-morrow. Than our fathers in forts, besieged by the enemy’s cannon. Fall on this house and hearth ; for this is the night of the contract. Filled the barn with hay, and the house with food for a twelvemonth. René Leblanc will be here anon, with his papers and inkhorn. And, as they died on his lips, the worthy notary entered. Sat astride on his nose, with a look of wisdom supernal. Children’s children rode on his knee, and heard his great watch tick. Suffering much in an old French fort as the friend of the English. With whatsoever else was writ in the lore of the village. And what their errand may be I know not better than others. “Must we in all things look for the how, and the why, and the wherefore ? When his neighbors complained that any injustice was done them. Over the laws of the land, and the hearts and homes of the people. Having no fear of the sword that flashed in the sunshine above them. Fell on an orphan girl who lived as maid in the household. Patiently met her doom at the foot of the statue of Justice. Freeze in fantastic shapes on the window-panes in the winter. Naming the dower of the bride in flocks of sheep and in cattle. And the great seal of the law was set like a sun on the margin. Lifted aloft the tankard of ale and drank to their welfare. Till Évangéline brought the draught-board out of its corner. Laughed when a man was crowned, or a breach was made in the king-row. Over the pallid sea and the silvery mist of the meadows. Rose the guests and departed ; and silence reigned in the household. Lingered long in Évangéline’s heart, and filled it with gladness. And on the oaken stairs resounded the tread of the farmer. Soon with a soundless step the foot of Évangéline followed. Lighted less by the lamp than the shining face of the maiden. Silent she passed the hall, and entered the door of her chamber. Linen and woolen stuffs, by the hand of Évangéline woven. Better than flocks and herds, being proofs of her skill as a housewife. Swelled and obeyed its power, like the tremulous tides of the ocean. Naked snow-white feet on the gleaming floor of her chamber ! Waited her lover and watched for the gleam of her lamp and her shadow. Flitted across the floor and darkened the room for a moment. As out of Abraham’s tent young Ishmael wandered with Hagar ! Pleasantly rose next morn the sun on the village of Grand-Pré. Sat in the cheerful sun, and rejoiced and gossiped together. All things were held in common, and what one had was another’s. Stript of its golden fruit, was spread the feast of betrothal. Fairest of all the maids was Évangéline, Benedict’s daughter ! Noblest of all the youths was Gabriel, son of the blacksmith ! “You are convened this day,” he said, “by his Majesty’s orders. Ever as faithful subjects, a happy and peaceable people ! “Down with the tyrants of England ! we never have sworn them allegiance ! Spake he, as, after the tocsin’s alarum, distinctly the clock strikes. “What is this that ye do, my children ? what madness has seized you ? Not in word alone, but in deed, to love one another ! Is this the fruit of my toils, of my vigils and prayers and privations ? Have you so soon forgotten all lessons of love and forgiveness ? Thus with violent deeds and hearts overflowing with hatred ? Lo ! where the crucified Christ from his cross is gazing upon you ! See ! in those sorrowful eyes what meekness and holy compassion ! Peasant’s cottage with golden thatch, and emblazoned its windows. Threw the long shadows of trees o’er the broad ambrosial meadows. Charity, meekness, love, and hope, and forgiveness, and patience ! Meanwhile, amid the gloom, by the church Évangéline lingered. Told her that God was in heaven, and governed the world he created ! Echoed far o’er the fields came the roll of drums from the churchyard. “Sacred heart of the Saviour ! O inexhaustible fountain ! Saw she slowly advancing. Alas ! how changed was his aspect ! Thus to the Gaspereau’s mouth moved on that mournful procession. While in despair on the shore Évangéline stood with her father. Like unto shipwrecked Paul on Melita’s desolate sea-shore. E’en as the face of a clock from which the hands have been taken. 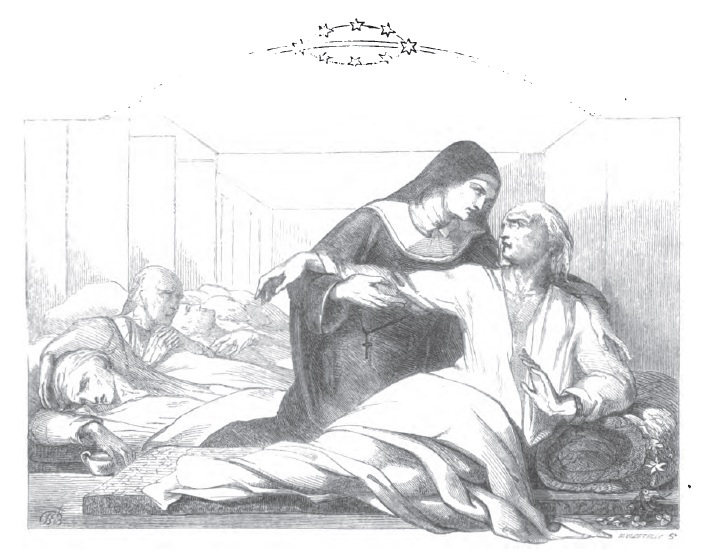 “Benedicite !” murmured the priest, in tones of compassion. Broke through their folds and fences, and madly rushed o’er the meadows. Knelt at her father’s side, and wailed aloud in her terror. “Gabriel Lajeunesse !” they said ; “O, yes ! we have seen him. “Gabriel Lajeunesse !” said others ; “O, yes ! we have seen him. Then would they say : “Dear child ! why dream and wait for him longer ? Who have hearts as tender and true, and spirits as loyal ? Many a tedious year ; come, give him thy hand and be happy ! Then would Évangéline answer, serenly but sadly, – “I cannot ! Said, with a smile, – “O daughter ! thy God thus speaketh within thee ! Patience ; accomplish thy labor ; accomplish thy work of affection ! Cheered by the good man’s words, Évangéline labored and waited. With them Évangéline went, and her guide, the Father Felician. Tired with their midnight toil, the weary travelers slumbered. Such was the vision Évangéline saw as she slumbered beneath it. At the helm sat a youth, with countenance thoughtful and careworn. Said with a sigh to the friendly priest, – “O Father Felician ! Is it a foolish dream, an idle and vague superstition ? Then, with a blush, she added – “Alas for my credulous fancy ! “Daughter, thy words are not idle ; nor are they to me without meaning. On the banks of the Têche, are the towns of St. Maur and St. Martin. Filled was Évangéline’s heart with inexpressible sweetness. Stood a cluster of trees, with tangled cordage of grapevines. Over Évangéline’s face at the words of Basil a shade passed. “Be of good cheer, my child ; it is only to-day he departed. Foolish boy ! he has left me alone with my herds and my horses. Waited his late return ; and they rested and feasted together. Welcome once more to a home, that is better perchance than the old one ! Suddenly paused, with a pinch of snuff half-way to his nostrils. “Only beware of the fever, my friends, beware of the fever ! Wandered alone, and she cried, – “O Gabriel ! O my beloved ! Art thou so near unto me, and yet I cannot behold thee ? Art thou so near unto me, and yet thy voice does not reach me ? Ah ! how often thy feet have trod this path to the prairie ! Ah ! how often thine eyes have looked on the woodlands around me ! Thou hast lain down to rest, and to dream of me in thy slumbers. Touching the somber leaves, and embracing and filling the woodland. Feasted, and slaked their thirst from the water gourd of the teacher. Even the blood-red ear to Évangéline brought not her lover. “Patience !” the priest would say ; “have faith, and thy prayer will be answered ! Saying a sad farewell, Évangéline went from the Mission. Found she the hunter’s lodge deserted and fallen to ruin ! “Gabriel ! O my beloved !” and died away into silence. As in the days of her youth, Évangéline rose in his vision. Vanished the vision away, but Évangéline knelt by his bedside. “Vainly he strove to rise.. ” Illustration, Jane E. Benham, wood engraving. All the dull, deep pain, and constant anguish of patience ! Thousands of weary feet, where theirs have completed their journey ! 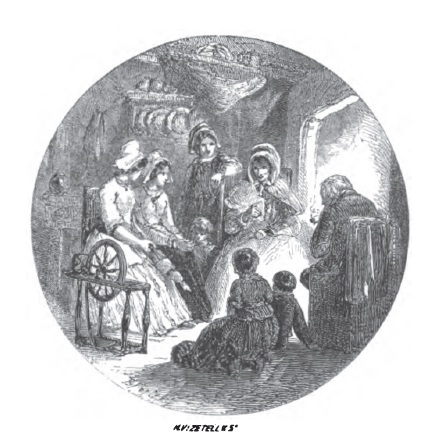 ” Maidens still wear their Norman caps and their kirtles of homespun, And by the evening fire repeat Évangéline’s story .. ” Illustration by Birket Foster, wood angraving. Blaise Cendrars : Pâques à New York – texte original et intégral. – Prose du Transsibérien et de la Petite Jehanne de France – texte original et intégral. Le Vaisseau d’Or. A new English translation of Nelligan’s masterpiece. The English translation et le poème original Le Vaisseau d’Or en français. Winter Evening by Émile Nelligan. A new English translation of Soir d’Hiver (“Comme la neige a neigé!”). The English translation et le poème original Soir d’Hiver en français. Arthur Rimbaud : Le Bateau ivre – Ô saisons, ô châteaux, – Rimbaud, le Bateau ivre, et un « lapsus-coquille » : Je est autre. “ The present volume is the first collection of Sri Aurobindo’s letters on poetry, literature, art and aesthetics to bear the title Letters on Poetry and Art. ” It incorporates material from three previous books: (1) Letters on Poetry, Literature and Art; (2) Letters on “Savitri”, and (3) On Himself (section entitled “The Poet and the Critic”). ” It also contains around five hundred letters that have not appeared in any previous collection published under his name. ” The arrangement is that of the editors.